I’ve been waiting for this one since I first learned that So Ji-sub was coming back to the small screen AND that it was going to be in a drama by the writer of Shopping King Louis. It’s just icing on top really that it’s a spy comedy, which is a fantastic mash-up when done well. Thankfully, these first episodes point to this being a funny, zany ride with some heartwarming family antics. If the mystery doesn’t quite hold my attention yet, well, it has time. Sitting bereft at her husband’s funeral, Ae-rin dazedly wonders if she will be able to raise her children Joon-soo and Joon-hee well without him. Ae-rin’s mother gently assures her that she will, and tells Ae-rin that she’s proud of how she has bravely faced all the hardships life has already thrown at her. Overcome, Ae-rin collapses sobbing into Mom’s shoulder. This is the exact moment that Kim Bon sees as he walks past. He doesn’t stay long though, as he gets chased away by NIS Chief Kwon Young-sil and her goons. Dry-eyed now, Ae-rin briefly recognizes the picture of the (murdered) chief security officer of the Blue House, Moon Sung-soo, but she doesn’t have time to contemplate where she knows him from. Ae-rin learns her kids have gone missing and dashes off in a panic… as we see that the Joon-Joon twins are being led away by dangerous killer K.
Chief Kwon is in hot pursuit, determined to catch Bon because he’s a highly wanted criminal. Back at NIS headquarters, agent Ji-yeon’s eyes widen in shock as she realizes that Bon has surfaced, though it seems she has her own reasons for wanting him found. Bon tries his hardest to lose Chief Kwon, but it’s difficult with genius hacker Do-woo on his digital tail, guiding Kwon and her men after him through crowded corridors and open spaces. A quick change into a janitor’s uniform has him fooling Do-woo and Ji-yeon long enough for him to slip out the front of the building into a taxi. But it isn’t over yet, as Do-woo tracks Bon’s taxi by satellite. Still uneasy, Bon instructs the driver to head into the Mabong tunnel, and Chief Kwon smiles like the cat with the cream as she follows. As the parents furiously update the network, they are able to track the children and K down, and follow their progress through the streets. Eun-ha and her gaggle of parents run off to confront him. K, completely unaware, walks along with Joon-soo and Joon-hee… until one, two, three and then a whole mob of angry mothers surround him. Taking in the scene, K decides to cut his losses and makes a break for it. As Chief Kwon and her NIS agents lock down the tunnel, she smirks at the sight of Bon’s taxi emerging. The agents halt the car, guns drawn—only to find that it’s empty inside. Bon jumped out inside the tunnel. Womp womp. A distraught Ae-rin finally reaches her children, who are shaken but safe, and gathers them close to her. At the same time, Bon exits his taxi and K jumps into the front to make his escape. Bon does a double take, but walks away without realizing who it was. Ae-rin pulls back to scold Joon-soo and Joon-hee for taking off with a strange man. This is too much for the pair on top of almost being kidnapped, and they dissolve into wails. Joon-hee sobs that she only went because the man said that Ae-rin was crying and needed them. This comes as a bad shock to Ae-rin, who resolutely wipes her tears away and bluffs that she was actually sweating from her eyes because she ran so fast to get here. With the trust of little children, her kids accept this and promise never to follow strange men again. The police finally show up, and a passing Bon is taken aback to see the photo of K with Ae-rin’s children on one of the mother’s phones. Back at home, Bon stands in front of his investigation board (he wouldn’t be a spy without one) and thoughtfully notes that “that man” has appeared again. He can’t understand why Ae-rin is caught up in this, but resolves to keep an eye on her. Without her husband’s salary, Ae-rin has taken on new jobs, delivering milk and working in a cafe, to pay the bills. Bon comes in to the cafe, and looks sympathetic as Ae-rin is lightly scolded for wearing her pain patch while working with food. At NIS headquarters, Ji-yeon is forced to admit to her boss Director Shim that Terrius got away again. But Ji-yeon can’t let the opportunity pass, and presses Director Shim about why Terrius would show up after three long years for Chief Moon’s funeral. She asks for Director Shim’s support in looking into Chief Moon’s death deeper. The resourceful new recruit Do-woo takes matters into his own hands after Ji-yeon refuses to tell him who Terrius is—by tricking Chief Kwon into giving him her finger prints so he can hack the system. Oh, lol. What he finds: Operation Candy. Three years ago, a nuclear physicist from North Korea failed to escape to South Korea, and was killed. It was suspected that former NIS agent Terrius was the leak. Chief Kwon is certainly convinced that Terrius was the mole and asks Director Shim for resources to go after him. Although Ji-yeon pushes back, and demands evidence, Chief Kwon trusts her instincts. After all, the USB containing nuclear technology is still missing, and Terrius was the only one who disobeyed orders to withdraw during the mission. On top of that, he broke free from top-security interrogation, and injured his colleagues in the process. Dressed in disguise again, Bon dupes his way into a security guard office, looking for evidence from August 31, the day Chief Moon was killed. But someone got there first, as all the records for that day are gone, in a suspicious power outage. Finally getting round to cleaning out her husband’s car, Ae-rin finds the now-moldy tarts he bought, when her kids run up with a beleaguered Eun-ha in tow. Looking awkward, Ae-rin thanks Eun-ha for helping out with the kids and promises it will only be until she can afford a proper sitter. Eun-ha tartly points out that she wouldn’t do this for anyone else, but sympathizes when Ae-rin admits that she is finding it difficult to even get to the interview stage of job-hunting. At home, Ae-rin reads the kids a bedtime story, but she can’t stop the tears from leaking when they say they miss their father and ask when he’ll be home. Joon-hee thinks it might be as long as three years since he’s gone to heaven. Later that night, Ae-rin cries in earnest away from the sleeping children. Back to the grind of job-searching, things actually start to look up for Ae-rin as she gets a call from J International—she got the secretary position! Uh-oh. In typical fashion, Eun-ha is pleased to hear about Ae-rin’s fortune, Sun-mi is incredu-jealous and Ki-young calls out Sun-mi for her negativity. I love this trio and their bickering. Meanwhile, Bon is lurking near Ae-rin’s kids as they are playing under the watch of their new sitter. Upon overhearing that the sitter is going to meet up with someone, Bon is immediately suspicious that it’s K. Bon stands in her way, and deftly handles her phone away from her to call back whoever it was… and her lover answers, to coo sweet nothings down the phone. Ha. Ae-rin picks the wrong moment to walk up, and gets completely blindsided as the sitter assumes that Ae-rin didn’t trust her and set Bon to watch her. Bon doesn’t say a word to help as Ae-rin tries to persuade the sitter not to quit, but its futile. Stuck because of his meddling, Ae-rin asks if what the sitter said was true. Thinking (not that quickly) on his feet, Bon stiffly spins a story that he was just passing by and claims that he was concerned for the kids’ safety. Ae-rin generously gives him a pass, and goes to shepherd her children home. Rapidly calculating, Bon stops Ae-rin and offers, “If you need help, and don’t have time to find it, can I do it? I’ll be their sitter.” Bon looks briefly down at the unruly kids, and flashes a truly terrible fake smile. Ha. Flabbergasted, Ae-rin has no words. Back at home, Ae-rin hurriedly attempts to tidy up the mess, while Bon sits uncomfortably squashed into a child’s chair. 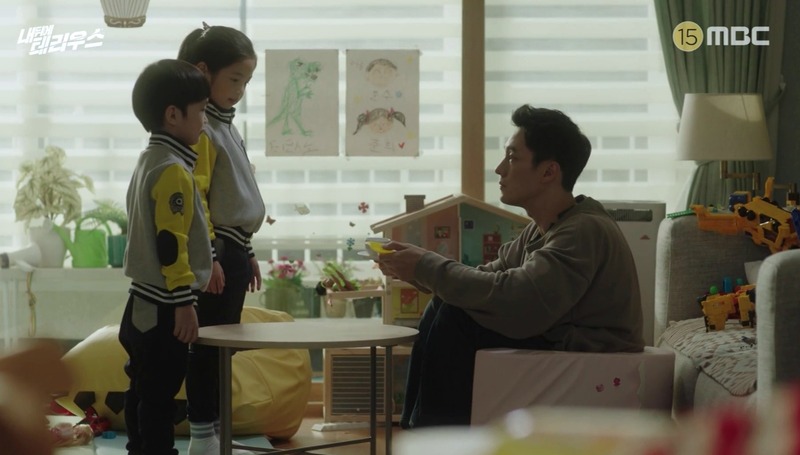 When Ae-rin steps away to make him a drink, the two children sidle over—Joon-hee offers an empty teacup for Bon to drink from, and Joon-soo offers a very dirty gummy bear for him to eat. Bon gamely sips from the dainty cup, and Joon-hee cutely rewards him with a little heart sticker—and then comes the stand-off as he stares down at the dirty sweet contemplating whether he can eat it. Joon-soo looks expectantly on. Bon raises it to his lips. Ha, it seems like this is a regular trick of Joon-soo’s. Ae-rin pulls him aside, not quite out of earshot of Bon, and interrogates Joon-soo on where he got the sweet. The options just keep getting worse—the public toilet, the dog house, the street sewer?! Bon is relieved to hear that it was “just” from the playground. I’m dying here. Ae-rin sets a drink down in front of Bon (who takes it verrrry hesitantly) and thanks him for his kind offer—but since she doesn’t know him, or why he wants the job, she can’t accept. Bon quickly lies that he is actually in need of some money, and follows up that it can just be a trial period until Ae-rin can get a permanent sitter. Still unsure, but out of options, Ae-rin agrees. Who is at that moment listening to a song that gives K pause. It’s the same song K heard three years ago, eavesdropping on “Candy” while she was hiding in Poland. A perky Ae-rin shows up at work, and with a completely serious face, Yong-tae lists out the super important tasks that she absolutely can’t mess up—like getting his morning coffee and changing out the flowers. And that’s it. Slightly put out, Ae-rin notes that she can do other office work, but Yong-tae tells her that she should just concentrate on what he tells her to do. Yong-tae adds that there’s one more thing—Ae-rin must never go into the locked room beside his office. Workout scene! Bon is in the middle of push-ups when his doorbell rings, and our super-spy must not get visitors often because he retrieves his gun first to answer the door—to the friendly neighborhood trio. They’re here to “interrogate” the babysitter, but they don’t get any answers that are useful—Bon doesn’t know his age, won’t tell them where he went to school and was exempted from the military. Haha, all these answers are making him look like a bum. Eun-ha poses one last important question, a cryptic mix of slang and shortened words that parents would understand to see if Bon can translate what she means. Although he tries, it’s too difficult, and the trio disappointedly dismiss him. Aww, Bon walks away repeating the right answer to himself. Putting Ae-rin in the awkward position of not being able to say no, Yong-tae asks if she will go out for a celebratory drink with him later. He guesses that she doesn’t want to be late for her kids, but accepts her reluctant yes anyway. Waiting for the Joon-Joon twins at the bus stop, Bon looks hilariously out of place, a fact the other mothers don’t miss (one of them even comments that he looks like So Ji-sub!). Dressed all in black, with his arms crossed, Bon does cut an intimidating figure for Joon-soo and Joon-hee when they get off the bus. At least he (tries to) smile down at them when he realizes that’s what the other parents are doing. The playground is another new experience for Bon (and for Sun-mi and Eun-ha, who swoon over how good Bon looks downing a drink) where he gets co-opted into playtime with the twins. That dead-eyed look on Bon’s face is priceless, as the indefatigable pair clamor for more rides. Thankfully, Sang-ryul comes along to distract them, and Kim Bon looks up at the man as if he’s a savior. Later the twins settle in for their dinner, and Bon is touched that Ae-rin packed one for him too (yes, with cutely shaped food and everything) even squirreling away the lollipop she gave him. When Ae-rin apologetically rings to tell Bon she’s going to be late, he doesn’t seem to mind at all. Although Ae-rin tries to discuss work with Yong-tae, she inwardly cringes that he sounds like a pervert when he tells her to concentrate on his handsome face instead. To put Yong-tae off she hurriedly mentions her two children and lies that her husband is still alive, and Yong-tae stares sharply at her, knowing the truth. Meanwhile, Ji-yeon finally tells Do-woo about Terrius—he was a legendary black ops agent, who was the best in every field. Terrius was very skilled at hand combat (as we cut to Bon reflexively disarming Joon-soo of his toy sword) and a master of disguise (as we see Joon-hee decorate him with princess clothes). Do-woo asks whether it’s true that Terrius and Candy were in a relationship—Ji-yeon sadly confirms they were, even though it went against orders. The twins decide that they don’t need to brush their teeth since they did it yesterday—and Bon decides to deal with this by offering a push-up competition where only the loser will need to brush. Facepalm. The two children are worn out at last, and Bon puts them to bed. At nine-thirty Ae-rin comes rushing in, apologetic that she’s so late. Bon is calm though, and she is even surprised that the kids are already in bed. Impressed, Ae-rin asks Bon if he will continue watching her kids—full-time. The two properly introduce themselves, and sweetly shake on the deal. Exasperated to learn that her daughter’s bike has been stolen—on August 31—Eun-ha heads to the security guard office to see if there are any clues on the CCTV. And there, on the screen, is Cha Jung-il, right before he died. The gang urge the security guard to check the other cameras, and zoom in on the man’s face and Bon’s face tightens as he recognizes K. But there is a love-heart spy bug stuck on the wall—K can hear every word the gang says. What a zippy, fun start to the show. I’m enjoying our main duo, the kids are cute, and the mystery is gathering enough pace right from the start that I’m not worried we’ll get bogged down in it. Grounding the action in Ae-rin’s family drama was a smart call before we get swept up in the spy drama side of things, and the balance feels right to me at the moment. The stakes have been raised because their family unit has been splintered, and Jung In-sung brought enough pathos to this episode that it felt like a loss even though we didn’t know Cha Jung-il well. Alongside this, the comedic moments have been nicely layered in as well, undercutting what could be overly serious scenes. I belly-laughed when the tables turned on K, and the mob of angry women threatened to overwhelm him. It felt like a triumph that these parents have banded together, and that touch of absurdism elevated what could have been a very scary scenario. I do love So Ji-sub in a good comedic role as well, because he’s so good at letting warmth bleed through and playing up awkwardness against his inherent cool-guy image. And let’s not forget the neighbourhood trio, Eun-ha, Sang-ryul, and Sun-mi, who are basically gold in every scene they’re in. They’re protective of Ae-rin, gathering round in her time of need, and by extension it looks like they’re going to try and make Bon into the best sitter that he can be. Even Yong-tae, our villain, is off-kilter in a light-hearted way when he’s with Ae-rin (who I’m pleased to say, doesn’t find him cool or handsome at all). That was something I appreciated in this writer’s previous show, Shopping King Louie, because the villains were so ineffective it was laughable. I don’t anticipate that Yong-tae is going to be as toothless as they were (at least, I hope not, because I do want some tension please) but it does make think that he’s going to be a real character. Perhaps even with conflicting motivations, because he seems to know and like Ae-rin, though there’s a mystery there too since she doesn’t recognize him. Bon and Ae-rin haven’t had much interaction yet, but I’m willing to wait a little longer for it (not too much longer, though show!) because the hints we have had have been simple and sweet. That handshake was really lovely, and not least because I suspect it’s the most human contact Bon has had with someone else in 3 years. We’re already getting clues that he closed himself off emotionally because something happened to his girlfriend Candy, not just because he’s on the run. Ae-rin on the other hand, is open and generous, so she’s surrounded by family and friends that love her. What Ae-rin needs is a fulfilling role in life beyond that of a mother, and I’m beyond pumped to see her get some of that back. Even at her new job, Ae-rin is ambitious, has an admirable amount of self-respect and isn’t content with Yong-tae’s “no-work’” policy. I’m thinking that locked door of his won’t stay locked much longer. Honestly though, I’m all in for the cuteness, which I’m getting from Bon and the kids, especially since it picked up in these episodes. The Joon-Joon twins are hitting the right note between mischievous and adorable for me, and they already have Bon wrapped around their finger. It’s clear he is so, so unused to being around kids but they both seem to like him (possibly because he can be conned so easily) and he tentatively likes them too. Bon is a great character so far—he’s stoic without an ounce of machismo, and so much more easygoing and adaptable than your average TV drama elite spy. Though I’m sure that’s what made him such a good spy. Well, that and the laser focus he has on his end goal. Bon’s going to need all the skills he has though, if he’s going to be able to look after two wayward children, work out a three-year old mystery, AND keep everyone safe from a dangerous assassin.